For end-users a datepicker is one of the most appreciated widget. It allows to simply edit a date value with the help of a user-friendly pop-up calendar. That's why nearly all UI frameworks provide a version of this widget. Be self-contained: we must be able to distribute it and use it in other projects without requiring any kind of additional configuration. Have a customizable date format: developer must be able to decide the date format used to display date value and to parse user input. Be localizable: the pop-up calendar must be localizable in order to support different languages. That's what we'd like to have with our custom datepicker. In the rest of the chapter we will see how to implement the features listed above and which resources must be packaged with our component. To make JQuery UI available we should instead go to its official site, download the required artifacts and use them as package resources of our component. jquery-ui.min.js: the minified version of the library. jquery-ui.css: the CSS containing the style used by JQuery UI widgets. 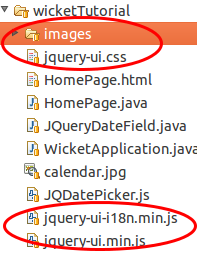 Folder 'images': the folder containing picture files used by JQuery UI widgets. inputId: the id of the HTML text field corresponding to our custom component instance. dateFormat: the date format to use for parsing and displaying date values. calendarIcon: the relative URL of the icon used as calendar icon. As we will see in the next paragraphs, its up to our component to generate this parameters and invoke the initJQDatepicker function. Function initCalendar is a simple utility function that sets the initialization array for datepicker widget. For more details on JQuery UI datepicker usage see the documentation at http://jqueryui.com/ datepicker. The first thing to do inside onInitialize is to ensure that our component will have a markup id for its related text field. This is done invoking setOutputMarkupId(true). Next, JQueryDateField tries to retrieve the date format and the ISO language code that must be used as initialization parameters. This is done using class ResourceModel which searches for a given resource in the available bundles. If no value is found for date format or for ISO language code, default values will be used ('mm/dd/yy' and 'en-GB'). To generate the relative URL for calendar icon, we load it as package resource reference and then we use Component's method urlFor to get the URL value (we have seen this method in paragraph 7.3.2). The last configuration instruction executed inside onInitialize is the instantiation of the custom converter used by our component. This converter is an instance of the built-in class org.apache. wicket.datetime.PatternDateConvert and must use the previously retrieved date format to perform conversion operations. Now to tell our component to use this converter we must return it overriding FormComponent's method getConverter. If component is disabled the calendar icon must be hidden and no datepicker must be displayed. That's why renderHeader is skipped if component is not enabled. If we add more than one instance of our custom component to a single page, static resources are rendered to the header section just once. Wicket automatically checks if a static resource is already referenced by a page and if so, it will not render it again. This does not apply to the init script which is dynamically generated and is rendered for every instance of the component. 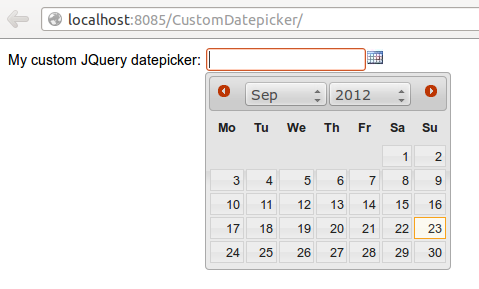 Our datepicker is not ready yet to be used with AJAX. In chapter 16 we will see how to modify it to make it AJAX-compatible. In this brief chapter we have seen how custom components can be integrated with DHTML technologies. To do so we have used most of what we have learnt in this guide. Now we are able to build complex components with a rich user experience. However this is not enough yet to develop Web 2.0 applications. We still have to cover a fundamental technology like AJAX and some other Wicket-related topics that will help us building our application in more modular and efficient way.